At Old World Stoneworks, we love to feature our customer’s finished projects. 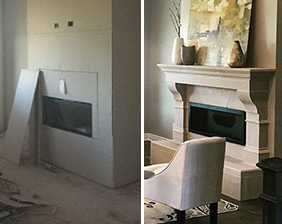 Browse the before and after fireplace and range hood photos below to see how other customers upgraded their homes and breathed new life into their favorite spaces. Would you like to be featured in our mantel and range hood before and after section? We’re always excited to hear from our customers so just email your photos along with your name, city, state and any description about your project or feedback on your interaction with us to [email protected] so we can share your inspired fireplace and range hood makeovers with the world! You can also check out our inspiration gallery for additional decor ideas.